Afterschool Programs run Monday through Thursday from 2:35 p.m. to 6:00 pm. 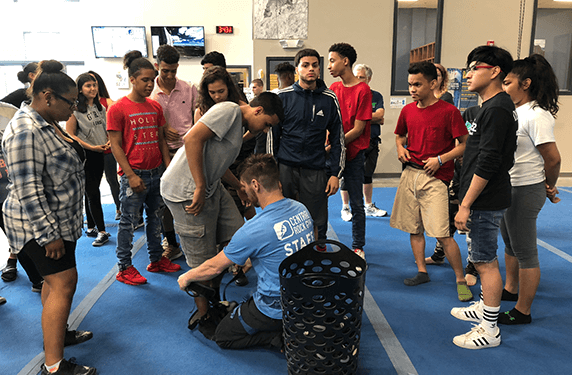 Students have the opportunity to participate in a number of programs including soccer, basketball, personal development, academic support, arts, music and so much more! All students are eligible to participate in this program, the only requirement is to fill out a member application in the main office. Programs are run by Alvarez teachers and community partners including Steam Box and Young Voices. Dinner is served and we offer free transportation at the end of the day either to their neighborhood or to the South Side Clubhouse for Teen Night. Join us! Our winter session now runs from January 22 to March 28! Also, come check out our first Badminton Tournament on January 28 at 3:00 p.m. For more information, please contact Chelsea Davignon, Program Director.